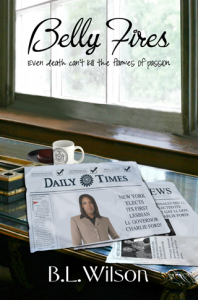 In Belly Fires, even death can’t kill the flames of passion, Lieutenant Governor Charlene Ford loses everything in a deadly car crash and nothing feels the same. One minute, she is at the top of her game as the first African American lesbian lieutenant governor of New York State. The next minute, she is trying to keep a stiff upper lip as she watches the gravediggers bury the two walnut coffins containing her son JJ and her life partner, Regina. Her family is gone. Her world is gone. All she wants is to go away and disappear for a while; to just get lost until the pain in her heart stops. She sneaks away from her security escorts and borrows her chief of staff’s ancient jeep. She and Rusty, her loyal Akita, climb into the old jeep and head for parts unknown.